This standard was framed for the purpose of furnishing suggestions for breeding to the breeders in their aims toward improving the breed to higher ideals and to try and establish an international breed on this particular hound strain of bloodlines to look alike and have universal conformation. It will be noted that this standard has been in existence for more than 60 years and the hounds that we are following to day are the result of the loyal, dedicated, hard work of those that have preceded us. The Black & Tan is one of many tracking breeds that were developed in the southern United States. The breed can trace its immediate ancestry to the American Foxhound and the Virginia Foxhound of colonial days, with probably the introduction of some Bloodhound stock. This latter would not only explain the coloration of the Black & Tan, but its tendency toward being larger boned than other breeds, its long ears and its famous cold nose. The American Black & Tan can probably be traced to the English Foxhounds, and before that to the Tolbot Hounds and St. Hubert hounds of France. These hounds were first brought to England following the Norman invasion in the eleventh century. The American Black & Tan was the first coonhound breed to be admitted into the registry with UKC. When they were first registered in 1900, and for several years after that, they were registered as American Black & Tan Fox and Coonhound. 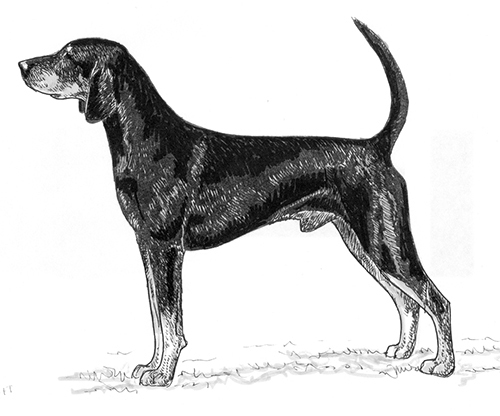 The Black & Tan Coonhound is a working hound that trails his quarry completely by scent. He is strong and sturdy without being coarse or cloddy. He is balanced, agile and sound, with the ability to cover ground easily, efficiently and tirelessly in the pursuit of game. Active, fast, bright, kind, confident and courageous, with open trailing and treeing instinct and ability. Carried well up, very slightly domed and broad between the ears, never narrow. Well-balanced with the other features of the head, medium square, with flews sufficient to give a square appearance. Nostrils large, open; black in color, never butterfly or pink. Prominent, hound-like, pleading expression. Dark brown or black, not lighter than hazel. Eyelids firm and close (no drooping). Set medium low, well attached to head and devoid of erectile power, should reach approximately to end of nose when drawn out. Should hang gracefully, inside part tipping toward muzzle, should not be too pointed at tip, slightly oval, soft and velvety, hanging in a roll when head is raised. Not too thick, nor too long, but graceful and strong; minimum of dewlap. Muscular and sloping; indicating speed and strength. Straight, smooth forearms, muscular, straight at knees, perfectly in line with upper leg. Deep, moderately wide, showing large lung space. Short and slightly arched, well muscled and strong. This is one important part of the breed. A good rule to breed to is the same distance from root of tail to shoulder as height at shoulder. HIPS Smooth, round, proportionately wide, flanks gracefully arched, muscular at the loins. Strong and muscular above hock. Slightly bent at hock and stifle, not cow hocked, free of dewclaws. Tight and well padded. Toes short to medium and close knit. Neither cat-footed nor splay-footed. Foot to be proportionate to the size of the body. Heavy, strong at root tapering there, rather long without brush, carried free, well-up, saber like. Smooth haired, fine, glossy, but thick enough for protection. Predominately deep, rich black, with tan trim covering not more than 10-15 percent of body. Small pumpkin seeds over the eyes. A little white on breast is not a fault, but no white elsewhere. Disqualifications: Albinism. White anywhere other than a small patch on the breast. Slightly more at shoulders than at hips. Males: 23-27 inches. Females: 21-26 inches. Dogs being shown slightly under weight due to hunting will not be penalized. This is a working breed and should appear as such. Males: 50-75 pounds. Females: 40-65 pounds. Males under 23 inches or over 27 inches. White anywhere other than a small patch on the breast.